Humans evolve with their surroundings. Whether you realize it or not, you’re not just a product of your environment, but an imitation of it. When it’s cold and dark you become more secluded and drawn in. When it’s warm and breezy, you become hopeful and light. You see possibilities again, feel the winds of change in the air as if they’re meant to for you – and they are. The winter made us tired and worn out. These last few weeks have been especially draining and today should be one of celebration because it’s the spring equinox. 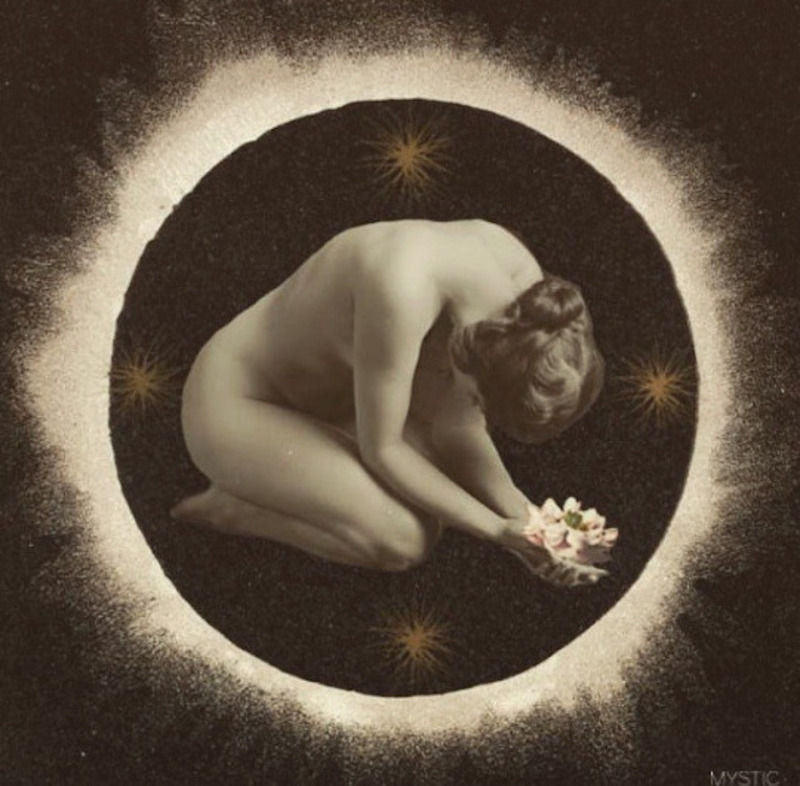 First, let’s talk about why spring equinox, also known as Ostara, is important. In it’s most basic understanding, it’s one of two days of the year when the sun can be seen directly above the Earth’s equator. It is the time when light and dark are once again at balance and completely equal. While for some it’s just the technical first day of spring, to others it’s a celebration of rebirth and an important day of reflection and renewal. Spring Equinox is celebrated as Ostara, one of 8 neopagan sabbats, or holidays, that make up the Wheel of the Year. Ostara is the once a year celebration when the sun passes over the celestial equator. 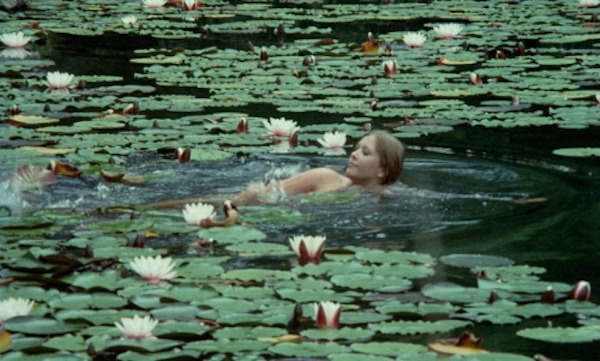 Ostara, or Eostra, is an Anglo-Saxon goddess who represents dawn. As a spring goddess she oversees the budding plants and burgeoning fertility of the earth. Similar to those observed at Easter, symbols for Ostara include eggs, rabbits, flowers and seeds. Many neopagans believe these symbols to represent the fecundity of spring and incorporate them into rituals, altars and celebratory feasts. A dynasty of Persian kings known as the Achaemenians celebrated the spring equinox with the festival of No Ruz — which means “new day.” It is a celebration of hope and renewal still observed today in many Persian countries, and has its roots in Zoroastrianism. So how will you celebrate this day? In as many small and big ways as you can. 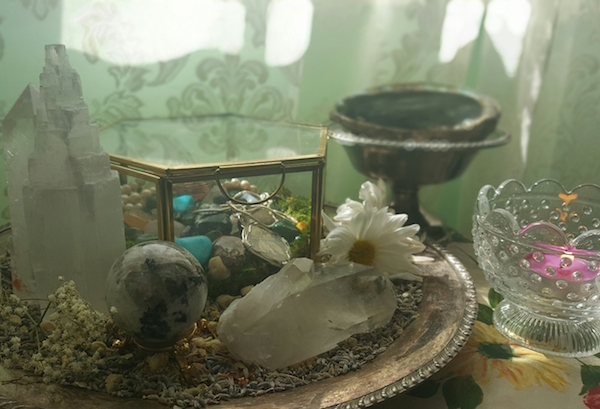 From the way you go about your daily routine to burning intentions in a fire ritual to placing eggs on your alter, there’s many different ways to ready yourself for the coming season. The most important ritual to take is to clear some time for yourself to set intentions. Make sure to add colors of the season. These colors include yellows, purples, blues, greens and pinks. Then add a symbol of balance. Symbols of balance include God and Goddess statues, black and white candles, sun and moon symbols and Ying and Yang. Also add something that represents “new life”. This could be an egg or a small bowl of milk. Spring is synonymous with new life, put things that are just being born or renewed onto your altar. 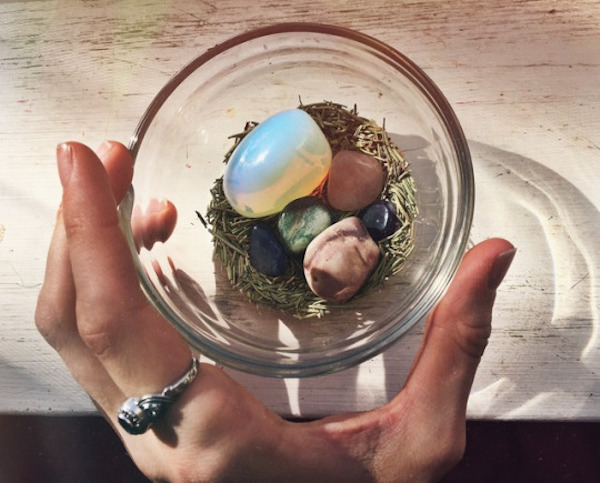 Arrange your crystals in a bed of rosemary to mimic a basket of eggs. Eggs are a symbol of fertility. You want this following year to be fruitful. You want the seeds you plant today to become budding dreams of the future. You must mimic the action of the season to reap its rewards. 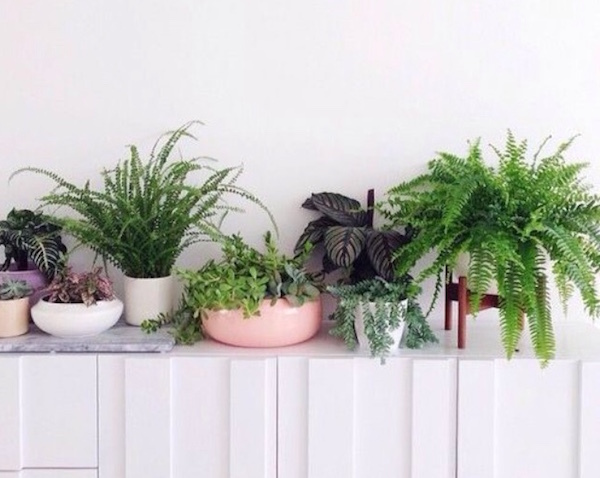 Buy yourself a new plant – maybe go that extra step and get a beautiful pot for it as well. Take your time and pick one that really speaks to you. If you can, buy it separately from the pot. You want to be able to go home and physically plant it yourself. This plant is a symbol of your new beginning and your dedication to taking care of not just yourself, but something else this season. You will grow alongside the plant and treat yourself in accordance. You will make sure you have plenty of water, sunlight and nutrition. You will not put any stress on your plant. You will let it grow naturally and at its own pace – just like yourself. You can also write yourself a check to the universe and plant it in the new soil of your plant. Use fire in a ceremony or ritual to surrender something that still needs to be unloaded. 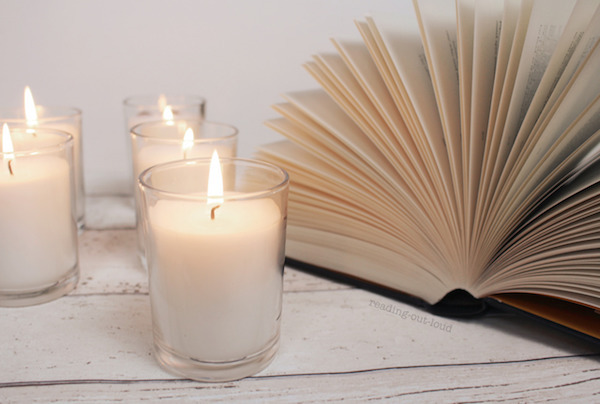 It can be symbolic as in burning a written narrative about what you are surrendering. Spring is renewal, taking the nourishment from the winter cycle and the freedom from surrender and weaving it into a new picture, a new expression and a new signature.